Finally, I am at a place where I can start another mixed media portrait. I am finding that this venue is very calming to my soul. I have a lot of things tugging at my heartstrings right now, with my oldest in Basic Training, trying to get my middle one to seriously think about what college he is most interested in, and my youngest with his 6 year old daily challenges. I have been working on the various stages of things that are being published, which is very exciting and new. I have to work on my interview questions later tonight, for the guest artist feature in Stampers’ Sampler later this summer. The editor just emailed them today and I think later this week, I will post the questions for you all to answer for yourselves. I can’t show you my answers though, you will have to wait and check them out this summer:-) Back to my newest portrait. I have been praying daily for my oldest, it is so hard not being able to talk to him. He had a 3 minute phone call and that’s it so far. When I was cleaning and organizing my collage sheets, I found the Madonna image that you see on my desk. It made me think of all of the mother’s over all the ages, praying for their children. It is with this inspiration that I am creating my piece. 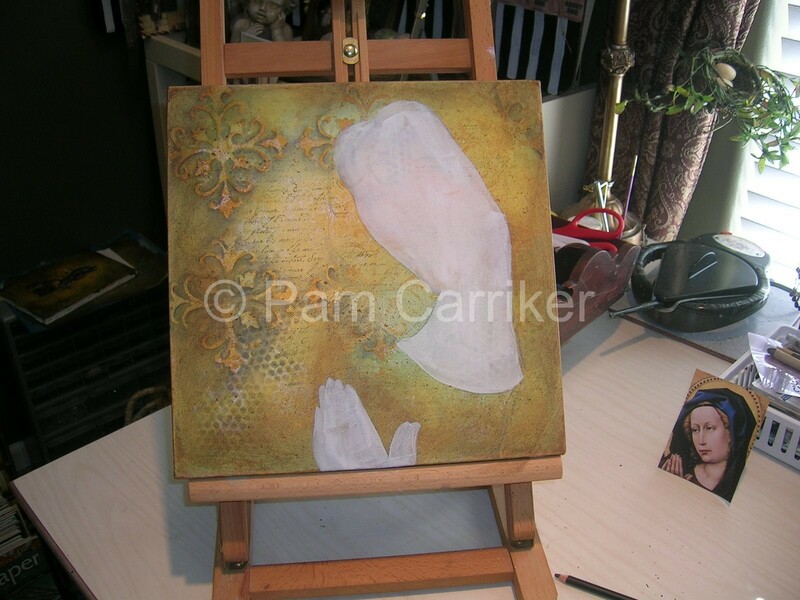 I am doing it on a 12x12x1 1/2 gallery wrapped canvas, and carrying the designs all the way around the edges. I am finding peace in painting this. It is from my heart and I can’t wait to see who she will be.